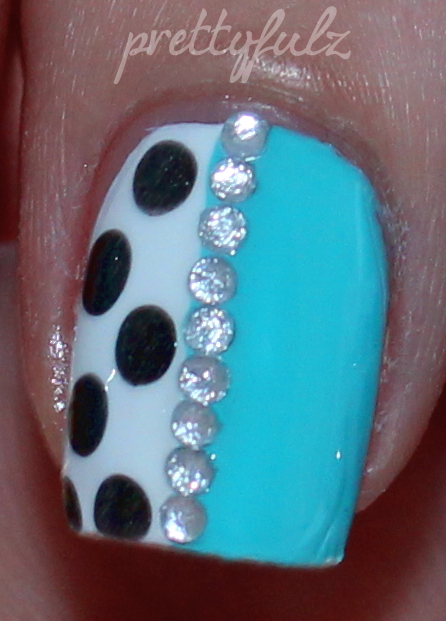 Prettyfulz: Blue Polka Dot Nail Art & Love Letter Nails!! So here is a nail art design that I did a week or so ago. It is super easy to do & if you don't have any rhinestones you can always use on of those LA Color Nail Art polishes in silver glitter and make a stripe down the nail instead. I started by painting my nails white, then adding the blue color on half the nail, added my black polka dots, then rhinestones. White Color: Sinful Colors "Snow me White"
Black Color: Sinful Colors "Secret Admirer"
Also, I ran out of daylight when it came time to my Valentine's Day nails, and I did them right before dinner, so I was unable to post them in a reasonable time, but I still figured I would share. I am sure you have seen this design floating around the internet and I saw it last year, and couldn't wait to try it out next Valentine's Day. 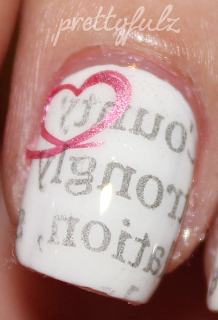 I painted my nails white, transferred the newspaper design, then added the heart image on the corner of my nails. Such a simple concept with a big impact. Pink Color: Sally Hansen "Pink Jade Chrome"
I love the vday look!!.. and the blue on the other nail is just beautiful! I absolutly love this look, so pretty and feminine!!! Love the rhinestones!! OMG I have fallen in love with the love letter design! I keep meaning to try printing text on my nails but now i'm definitely going to have to! great job on both designs! How did you "transfer the newsprint design" onto your nails? It looks amazing and I'd like to recreate it. Is that a nail stamp? wow - those are cute! What a lovely designs !!! I love water color. Your work is Great! Apke pita Pratap ji ke kaam ko dekhte hue bada hua. Apka blog pehli bar dekha aur itna prabhawit hua ki use maine favorit ke sath link kar diya. go for a paid option? There are so many choices out there that I'm totally confused .. Any suggestions? Thanks a lot! several websites for about a year and am anxious about switching to another platform. Hello very cool site!! Man .. Beautiful .. Superb . This article offers clear idea in support of the new visitors of blogging, that truly how to do blogging and site-building. Үour сurrеnt article hаs proven bеneficial to uѕ. extremely experiencеd іn this areа. sрeсific ѕubјect uѕіng intriguing anԁ sound written content. It’s very usеful and yοu're obviously very knowledgeable in this region. You possess opened up our sight in order to various views on this kind of topic using interesting and strong articles. I used to be able to fіnԁ good infoгmation from уour blog posts. I like your post and enjoyed a lot. Since I've discover nail arts, I began to browse for more designs that I can try for my nails. But as a beginner, I'm looking for simple nail art designs that I can try. Those just easy. These samples are truly tempting. I always spent my half an hour to read this web site's articles or reviews every day along with a mug of coffee. Any way I'll be subscribing for your feeds or even I success you get entry to constantly rapidly. grateful if you continue this in future. Superb website you have here but I was wanting to know if you knew of any forums that cover the same topics discussed in this article? I'd really love to be a part of group where I can get feed-back from other experienced individuals that share the same interest. If you have any recommendations, please let me know. Appreciate it! They are all easy and beautiful blue nail art design. Hello! I would like to open cosmetology salon. Do you have an experience in this business? There are too many options in beauty salon equipment. Could you give me an advise? What companies are more reliable to buy facial steamer for beauty salon and professional rf machine? Every week I will be posting my favorite nail art design from other bloggers. This week's design is from Nail Stories. Click the picture to visit her blog & show some love. How much would you spend on a nail polish? Striped Candy Shop Nail Art Design!! Comfy Sweater Nails & More Updates!! 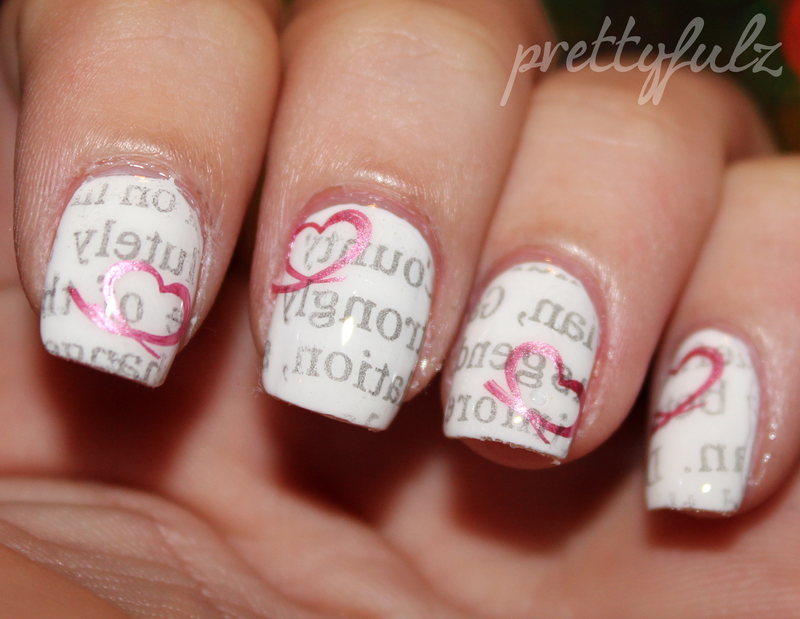 VALENTINE'S DAY NAIL DESIGN xoxo ..